- Freedom and independence are big issues. Encouraging children to do things on their own is very big on most people's agenda here. This is one of the things that struck me and my husband the most when we visited our first kindergartens here when we arrived. We were shocked by how much freedom children had within such establishments. At our children's kindergarten, children can go and play outdoors (from 5 years old), in the sports hall (from 3/4 years old), in the music room, etc unsupervised. Rules are set out in advance. Children learn them and once staff feel they are ready, they are let loose! If they break the rules, their rights are revoked for a certain period until they accept them again. It works really well. 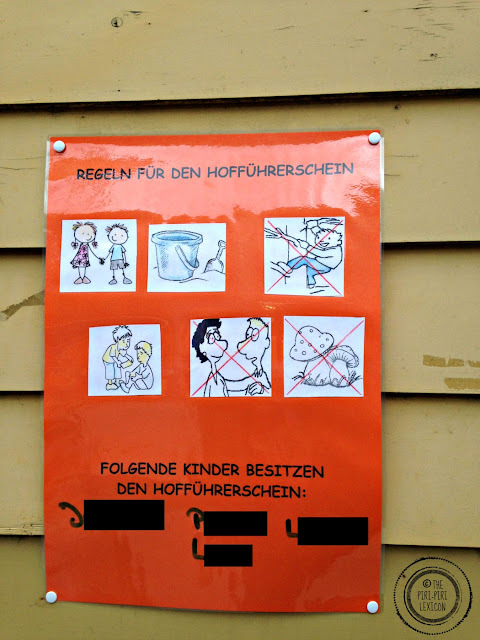 Kindergarten outdoor play rules for when the older children are unsupervised with the names of the children currently allowed to be outside without any adult. Dressing up is another aspect of kindergarten life where children are completely left to their own devices very early on. You often see little 2-year-olds struggling with trousers and socks in the corridor. Some would argue that this is slightly unfair and heartbreaking. I have often found myself helping some half-asleep children with their shoes or zips. I have also often felt uneasy at my daughter's dance class when mums wait outside of the building while their 4/5-year-olds dress up. Yes, my daughter can dress herself up but I like to be there for moral/emotional support. I like to see what is happening even from afar. When she tells me I can wait outside I will! Within the family circle, children walk or cycle to school alone from about 5/6 years old often crossing major roads and more. All of these things mean helicopter parenting is just not a thing in Germany. Nobody follows anyone in the playground. If you see a mum following her 2-year-old everywhere, she is probably a foreigner!! Freedom parenting is the thing. Germany is very big on everything green and natural. Organic food supermarkets are at every street corners. Flea markets selling solely organic clothing for kids are happening and are always a huge hit. Cycling everywhere year round is nothing extraordinary. Breastfeeding is encouraged, supported and much more widespread than in other developed countries. Everyone owns a baby carrier. 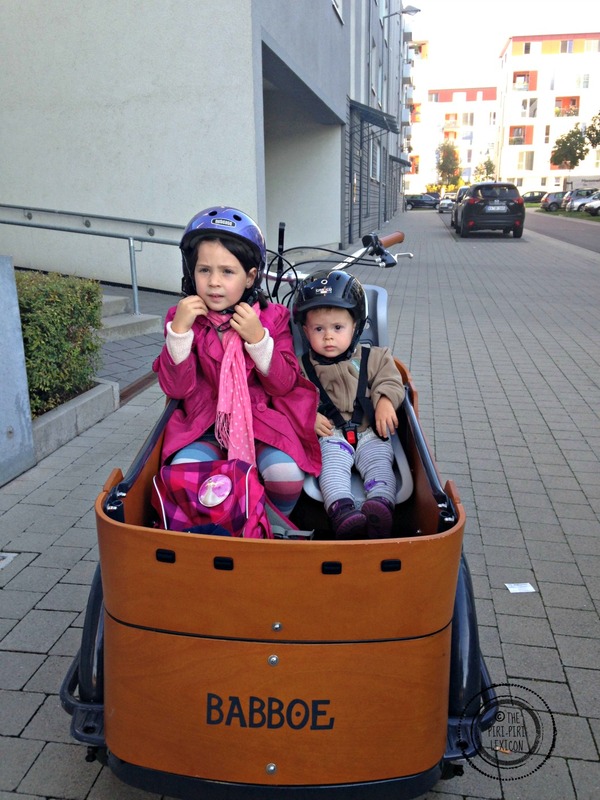 Green parenting is easy, cheaper than in other countries and more mainstream too. - Safety is not the first thing people worry about. In many countries these days, playgrounds cannot have this or that equipment because of the risks of x, y or z. People hand you a health and safety form before they even look at you (especially when it comes to children). All risks are eliminated before kids even get to them. Germany is not playing this game. Playgrounds are awesomely and appropriately dangerous: water, sand, concrete, wood, etc. People let their children play with /insert dangerous item here/. I remember being at a children's fair where there was a stand where kids could cut wood with a proper/grown-up axe. An Italian family walks by and screams, shouts and looks mortified that hundreds of German kids and their parents are waiting in line to have a go. Of course, the activity was monitored. It was appropriately dangerous. All risks were not removed. Parents understood the risks. Nobody has to sign any health and safety papers beforehand. And the children had fun. At my children's kindergarten, attended by children between 1 and 6 years old, an open fire is often lit for special events in the courtyard. Nobody is scared. Children are explained that this is hot, it is a fire, they shouldn't touch but there is no specific protection, no guard. Just a great open fire. Real Christmas trees with real candles on them? Check. The list goes on. many foreigners are horrified or shocked. I have to admit that it takes a while to get used to but I actually quite like that philosophy. I am not one for removing all risks for our children as it removes the chances for learning. I prefer to teach them to manage the risks by themselves. - Play comes first (until 6 years old). Kindergarten traditionally started around age 3. Most children attended it from that age. However, a recent push to see mothers go back to work earlier has meant that many now take younger children too. Children stay in kindergartens until they are 6 (or even 7 years old). These kindergartens are about playing. Whatever type they are (Montessori, outdoor, traditional), children do not learn their ABC or learn to write letters. A member of staff once told me that the criteria for proceeding to school was social readiness and being able to hold a pen/pencil properly! This is a far cry from what many other countries do. In our kindergarten they do 45 minutes of more school-like activities (art, science, etc) twice a week for the 5/6 year olds. I am told this is because half of the staff is French (it is a bilingual kindergarten) and they like to model a little on the French system. But this is apparently a lot more than many others do. As an expat, this would worry me if we had to move our kids at the sensitive time when in other countries, others would have learnt to write a book already! Yet, this is refreshingly modern and I, contrary to some, have completely embraced the years of "unstructured playing". You are 5 only once. Looking like a real little German child: rain trousers, boots, and hat. Don't forget your rain boots, your Matschhose (rain trousers) because you cannot survive without them in Germany. Babies nap outdoors on balconies in their prams. Children jump in muddy puddles by Arctic conditions. My girl had lunch in her snow suit in the courtyard of her playgroup (when she was only 1) on many occasions. Many kindergarteners spend their whole day in the forest, outdoors in unique structures that exist in few other countries. Other more traditional kindergartens take children out in the wild for camp outdoor activities as routinely as they possibly can. I have seen many non-walkers being laid on the floor at the playground in winter. 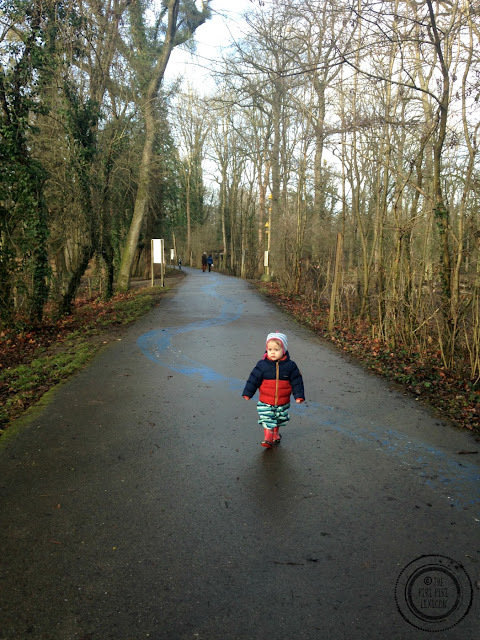 It is healthy, it gives children a better understanding of the world around them and is what most Germans do at the weekend too: being outdoors. There is a lot that is good in this list. Independence: We stand back every time he’s doing something on his own- however long it takes. We thought our 4 yr old was independent, bathing (except his back & ears! ), changing & putting on his seatbelt on his own but then his teacher pointed put that he needs to be more independent which really took us aback. more? you mean other kids do more? are you serious? but it was the little things, like asking for help to open his tiffin box kind of stuff. And the big thing is that I still feed him- he eats on his own only when others are around, not when it’s just us. I see it as - at least he’s not fussy and eats everything- but I wonder when will he sit and eat on his own like at least one meal a day! Outdoors: is something we’re *trying* to embrace since we moved to santiago- the air is cleaner and weather is nicer so we go biking to the neighbourhood park and enrolled him in a swimming class- they sound lame- not too adventurous I know- but it’s still a far cry from sitting on our asses at home in india ! Organic food is if neither in india nor chile. And it’s def not cheaper! Thanks for sharing. I love to learn about other cultures! 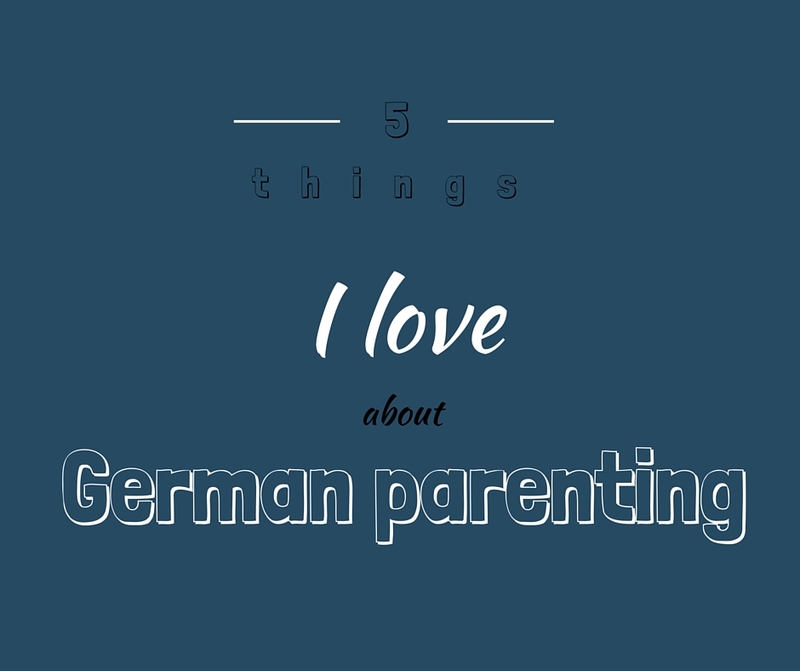 Thanks for the list and the reminder to be grateful for all these things I like about parenting in Germany! Being outdoors, playing and living as green as we can manage have become natural to us, even though my husband and I are from countries where I believe the emphasis is different. As my kids are little, I'm still not great on the independence thing though - something for me to work on! I am also an expat mum in Germany. It feels good to be reading about your experience in Germany, since I recognise a lot of thoughts and convictions that are mine as well, but that I don't dare to ventilate with my German girlfriends. Mentioning them to my (German) husband means just "another point of view". It's the point of view of an outsider, that's all. And I do identify with a lot around here, but that's not all. So, Annabelle, thank you for making me feel accompanied in my perceptions about "the German way of life"!! !